Across the U.S., there have been a number of good-faith efforts among utilities and solar companies to find a sustainable policy pathway for rooftop solar and other distributed energy resources that are challenging the traditional electric utility business model. In New York, six utilities recently partnered with three major solar companies on a proposed alternative to net metering, a policy that credits solar customers for excess generation they send to the grid. There are similar examples of collaboration in South Carolina and Maine. Evidently, there are ways for utilities and solar companies to work together to avoid solar policy battles that have been plaguing the power sector. A National Renewable Energy Laboratory report released last month identified four strategies that stakeholders can employ to resolve disputes on distributed solar going forward. But while the two camps seek to collaborate publicly, the contentious politics of solar are still alive and well behind the scenes. 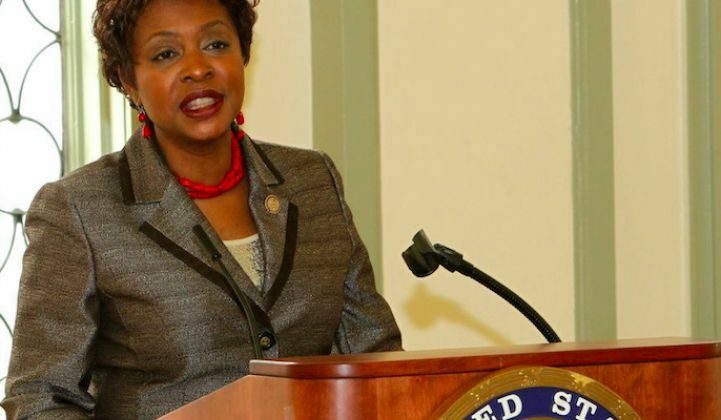 Ahead of a Federal Trade Commission (FTC) workshop on June 21, Politico Pro reported that New York Rep. Yvette Clarke (D) signed her name to a letter written by the Edison Electric Institute (EEI), a trade group representing investor-owned utilities. The letter claims that rooftop solar deals are a threat to consumers and calls on the FTC to commit resources to greater regulatory oversight. Grist published a copy of the document here. The FTC workshop is being held to examine competition and consumer protection issues in the rooftop solar business in light of the U.S. solar market boom. Stakeholders on all sides plan to use this opportunity to advance their cause -- the solar industry is looking to address monopolistic behavior from regulated utilities, while utilities are seeking to expose allegedly shady solar practices. There is a valuable conversation to be had on these issues. The troublesome aspect about Rep. Clarke’s letter is that she didn’t write it. Metadata shows that the document was created by Eric Grey, director of governmental relations at EEI. A lobbyist for Gray Global Advisors, which represents EEI, was the last person to make changes to the file. The letter was submitted to the FTC and circulated to other congressional offices with no mention of EEI’s involvement. Rep. Clarke’s office did not respond to a request for comment. EEI spokesperson Jeff Ostermayer indicated that the lobby group was not advising Clarke in an irresponsible way. “We are providing information to policymakers seeking feedback on the policy issues raised by the FTC workshop on solar power consumer protection issues,” he wrote in an email. Andrew Newbold, manager of public policy at Sunrun, sees it differently. For him, the letter is proof that utilities are willing to employ deceitful tactics in order to quash their solar competition. “I think it’s really important people understand that the biggest threat to consumers are these utilities that want to continue to hold on to their monopoly and dig their heels in on their practices,” he added. The rooftop solar market has seen exponential growth in recent years thanks to lower technology costs and the proliferation of solar leases and other financing options that allow customers to see immediate savings on their electricity bills. Now that solar is at a level where it’s eating into electricity sales, solar advocates say that utilities want to stop it. In Florida, a utility-backed group launched a ballot initiative to block a pro-solar ballot initiative seeking approval for third-party ownership in the state. Consumers for Smart Solar was created several months after a pro-rooftop-solar initiative started to gain traction, and has received around $7 million in funding from Florida Power & Light, Duke Energy and other utilities. The backers were revealed last fall by the Energy & Policy Institute, a pro-clean-energy think tank. Solar advocates argue the utility-backed ballot is anti-competitive and disingenuous since it does nothing to expand consumers’ options. At the very least, the initiative is confusing. The “Yes on 1 for the sun” campaign guarantees “the right” to go solar, but does not expressly encourage the adoption of solar. The initiative’s primary aim is to protect consumers from “scam artists, rip-offs and long-term contract traps while ensuring that those who do not choose solar electricity are treated fairly,” according to the initiative website. In another case of hidden influence, a lobbyist for Arizona Public Service drafted a letter criticizing solar that Arizona lawmakers submitted to the FTC and the Consumer Financial Protection Bureau. Several of those lawmakers have received funds from APS’ parent company, Pinnacle West, according to the Center for Responsive Politics. Thomas Van Flein, chief of staff for Arizona lawmaker Paul Gosar, who signed the APS letter, said using stakeholder-provided materials is not an uncommon practice, however. "I think this is not unusual, to even have a draft provided to you by other stakeholders," Van Flein told the Arizona Center for Investigative Reporting. "Sometimes you have the opportunity to make changes, sometimes you don’t." The Southwest is a particularly hot spot for hardball solar politics -- and not just on the utility side. In Nevada, the solar advocacy group Bring Back Solar Alliance spent $250,000 on TV ads in February in order to promote its ballot initiative, which seeks to undo highly unfavorable policy changes. Meanwhile, utility interests have responded with a lawsuit. In Arizona, both utilities and solar companies poured money into attack ads and lobbying efforts during a 2013 net metering battle -- although utilities spent significantly more. More recently, SolarCity supported a watchdog group leading a controversial investigation on Arizona utility regulators, accusing them of utility bias. SolarCity spokesperson Will Craven defended the company’s support for the Checks and Balances Project, pointing out that pro-utility groups have outspent the solar industry 8 to 1. “We owe it to the people of Arizona to help ensure that important decisions about their right to go solar are made in the light of day,” he told GTM last December. In April, however, SolarCity cut ties with Checks and Balances. At the same time, Jon Wellinghoff, former chairman of the Federal Energy Regulatory Commission, assumed the role of SolarCity’s chief policy officer. This spring, it appeared as though SolarCity and APS were going to put their differences aside and focus on policy solutions. Both parties agreed to drop competing ballot initiatives in favor of negotiating a net metering agreement. But the talks crumbled earlier this month after APS filed a rate case seeking to reduce the net metering credit. Meanwhile, there is an ongoing investigation in Arizona into APS’ contributions to “dark money” organizations that spent more than $3 million to influence the outcome of the 2014 Arizona Corporation Commission election. APS previously refused requests from Commissioner Bob Burns to provide information on its campaign spending. Last month, Arizona Attorney General Mark Brnovich announced that utility regulators have a legal right to question company executives over their political donations. The Attorney General’s office has also taken a look at allegedly shady actions within the solar industry. At the behest of Arizona State Sen. Debbie Lesko, Brnovich’s office investigated all of the solar-related reports they had received since 2009, finding 600 complaints. Attorney General spokesperson Ryan Anderson told GTM last year that his office has already taken action on those complaints, which he said stemmed predominantly from by “fly-by-night companies that come into the market and attempt…to capitalize on the popularity of solar in the state.” In response, the AG’s office cracked down on now-defunct solar firms Going Green, Go Green, Epcon Solar and Salt River & Wind. Without going into detail, Anderson said that his office has not yet found any evidence of egregious behavior among the major professional solar players. Solar companies say this is evidence that there’s no need for further oversight from the FTC or any other government body. States are already equipped to catch and punish bad actors. At the same time, the solar industry is developing resources to safeguard customers. Rep. Clarke’s precise motivations for submitting the EEI-authored letter to the FTC are unclear. Clarke has a very pro-environment voting record. But she is also a member of the Congressional Black Caucus, which has been a target of EEI’s lobbying efforts. Reports show that EEI has contributed at least $120,000 to the CBC, and has made the case to CBC leaders that communities of color are suffering from pro-solar policies like net metering. However, there is ample evidence that in most places net metering and the overall expansion of distributed solar is a net benefit to all consumers. Still, there is a legitimate discussion to be had around future solar policy and consumer projections. David Springe, executive director of the National Association of State Utility Consumer Advocates (NASUCA), said he is concerned that solar customers don’t fully understand that their rates may change and so will the economics of their solar investment. On that point, he agrees with the content of Rep. Clarke’s letter. “We can argue about whether or not EEI should be writing letters for people, but at the end of the day, EEI is not necessarily off-base in terms of the general principle -- we need to be communicating with customers in terms of how rates are structured and that rate structures can change,” he said. In general, NASUCA does not support demand charges or high customer charges, Springe said. But the organization is concerned about the potential for a cost shift if more and more solar customers come on-line and don't pay their fair share for using the grid, and about the potential for bad actors. Discussions on the costs and benefits of net metering are best left to the states, and not the FTC or Congress, he added. That’s largely because each state is so different. In Hawaii, where rooftop solar penetration is very high, it was time for a solar policy change. In Kansas, where Springe previously served as the top utility consumer advocate, there is time to allow the market to grow before adjusting the rates, he said. Springe said he represents both solar and non-solar customers and has met with both solar companies and utilities, and he firmly believes that both parties will continue to exist in the foreseeable future. Both camps have shareholders, both camps have customers, and both camps have products that customers continue to want. The key is to focus on the issues and not on smear campaigns that only serve to confuse customers, he said.